Brilliant work mate. Your work is so critical. It should be plastered over media. Unfortunately they’re complicit in the scam. Thank you Tony for disclosing our rotten society . Here in Europe it may be even worse , all temeperature-data in Holland UK and Germany has been homogenised a few years ago , downgrading temperatures from before 1950 with approx 1,5 degrees Celsius and upgrading temperatures after approx 2000 through deleting low temperatures , which did not their models .I caught KNMI in Holland of this malpractice twice even when I was not looking in particular for any . Just a slight interest on how certain matters were recorded and it turned out to be not good . Of course big silence upon reporting this .What is even worse that the minds of our children are being brainwashed with this garbage and that parents are sending young children into the Streets with a totally false perspective . It may be good that the sun novas regularly . Tony thank you for standing strong . Further c-ommunication with y-ou is s-ilenced nowadays through probable s-ecret s-ervic-e inte-rvention . Bravo – now President Trump needs to tweet this out asap! I trade commodities. We use weather based yield models to estimate production to get a jump on the market. I have been pulling out 0.4F from the NOAA data in an attempt to compensate for their politically motivated adjustments. But it looks like i need to up that number. If 2018 E data was 2.1F above measured and 61% is E, then i plugged in a drop of 1.3F in the yield model and came in within a 1/2 bushel/acre of USDA final yield. Corn plants don’t care about your politics. Thanks for putting these observations in one video! Actually, if Eisenhower could identify this factor, I’m sure that less principled elites already had, and Dwight might have only been noticing an ongoing program. From a contemporary perspective, Phil Jones, Michael Mann and James Hansen are getting money from SOMEWHERE, and that channel doesn’t seem to be inclined to fund research on counter-hypotheses, else we’d see papers on climate DEBATE. (Bill Gray’s fate is only one proof of this point, and he’s not alone). The image of scientists being free to choose what they consider to be the best research is naive: they’re constrained to varying extents to study to the interests of funding agencies. 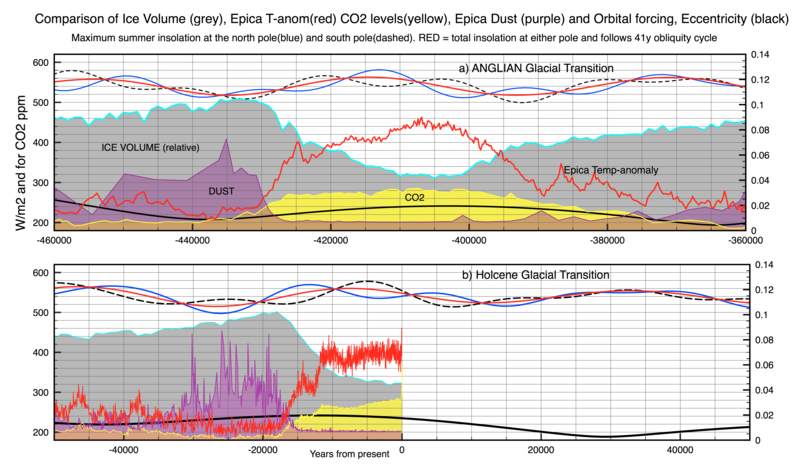 1) The marginal impact of CO2 on outgoing LWIR isn’t linear, it shows a logarithmic decay. The fact that they are manipulating the data to match a linear increase in CO2 proves it is a fraud. 2) You frequently reference the Eisenhower speech. You can clip that speech from this documentary on Global Warming. 3) The location of the weather stations is also addressed in that documentary and you could clip it as well. 4) That documentary makes a lot of predictions that have come true. The political predictions have been dead on. You may want to use some of those video clips as well. Further proof there is “man made global warming”….creating warming by manipulating the data. Of maybe another, proof of “Mann made global warming”. Tony, I would encourage you to use the term “climate-industrial-complex”, one term which can explain what is happening and why it is happening. Tony, thank you and keep up the fantastic work. Question, where can you get “untampered” or raw temperature data for further comparison with the tampered data? Who is publishing the untampered and the tampered data? Choose your format, follow the directions. I always thought Hansen played up the global warming scare to Congress as an excuse to get his/NASA budget jacked up or not cut since not doing space exploration. Hansen’s hand picked prodigy, Gavin Schmidt, is a corrupt Ph.D. mathematician continuing the manipulation. Note the dropped USHCN stations have latitude, rural, and I think altitude, bias. Raw temps are also from less than pristine stations, urban heat island effect, etc. http://surfacestations.org/ Reported GISS temps are also not in agreement with accurate post 1979 satellite data, RSS or UAHv6. The pristine station USCRN data collected since 2005 https://www.ncdc.noaa.gov/temp-and-precip/national-temperature-index/ shows no change in temps. In the future they will be laughing at this AGW scam hysteria, religion disguised as science or backed by fake science.